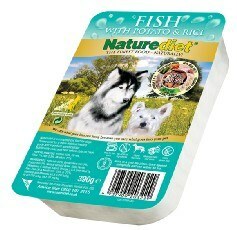 Nature Diet fish and rice flavour - this dog food review has been submitted by K9 Magazine reader Ellie Taylor. Sally isn’t on pure Nature Diet, we put it with JWB kibble as well. However, she was switched from ND Original over to ND fish a couple of months back and I have seen a difference. She has always enjoyed ND and JWB, but when we switched to the fish flavour she wolfed it down like there’s no tomorrow! I also noticed, as she’s 14 she just trots along at her own pace on walks, not a problem. However since she’s been on the fish ND, she’s started sprinting round with the puppies, earlier this morning for example she was sprinting round the field with the Briard! She generally seems much happier, no signs of stiffness (she’s not on any supplements) and she’s running round much more, which I haven’t seen her do in a long time. So, in summary, it seems to really help Sally and she thoroughly enjoys it. As a user I’d score Nature Diet Fish and Rice original as excellent value for money and definitely a product we'll be sticking with.